This natural-color view – seen as human eyes would have seen it – was obtained on Oct. 10, 2013. 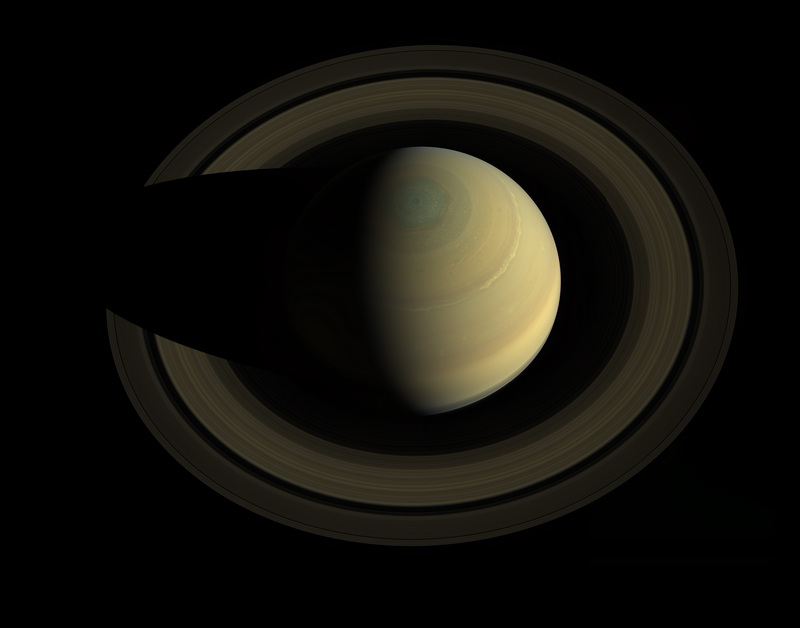 It shows off the differently colored bands of weather at Saturn. A bright, wavy stream of clouds around 42 degrees north latitude appears to mark some of the turbulent aftermath of a giant storm that reached its violent peak in early 2011. The mysterious six-sided weather pattern known as the hexagon is also visible around Saturn’s north pole. When Cassini arrived in 2004, more of the northern hemisphere sported a bluish hue and it was northern winter. The golden tones dominated the southern hemisphere, where it was southern summer. But as the seasons have turned and northern summer has begun, the colors have begun to change in each hemisphere as well. Golden tones have started to dominate in the northern hemisphere and the bluish color in the north is now confined to a tighter circle around the north pole. Cassini is currently in a special set of tilted orbits known as “inclined orbits” that allow the spacecraft to swing up over the north pole and below the south pole. Cassini was tilted as much as 62 degrees from the plane of Saturn’s equator in April of this year and will continue to work its way back down again till early 2015. Much of Cassini’s tour has involved orbits around the equatorial plane, where most of Saturn’s rings and moons are located. For more information about Cassini and its mission, visit: www.nasa.gov/cassini and http://saturn.jpl.nasa.gov.